At the time I’m writing this, the 2016 European Winter Preliminaries are currently underway to determine the participants for the 2016 European Winter Championships. It has been a long and winding road already, and Blizzard is no doubt working hard to improve their game when it comes to promoting Hearthstone as a top-class esports title. That said, a lot has happened on the way that should warrant careful examination by Blizzard staff in order to really make Hearthstone a legitimate contender with the level of professionalism associated with such status. In this post, I will go through some of the glitches that have caught my attention, and that should have caught Blizzard’s attention as well. Lesson #1: So where can you earn those points, exactly? In order to qualify for the preliminaries, players needed to finish in the top-128 in HCT points, which are awarded from selected tournaments (both online and offline) as well as from high legend ladder finishes. A word of praise is in order here: as draws were quite likely, Blizzard announced that everyone who was going to be tied at rank 128 would qualify for the preliminaries. This extension of the bracket avoided much speculation and confusion, and was a good move. Eventually, 151 players took part in the preliminaries. However, exactly where points can be earned seems to be difficult for Blizzard to communicate. The largest incident was with multiple weekly tournaments organized by Strivewire, an online tournament site, which claimed to award points (and did so in previous seasons, as well as on current season on the NA server), but ultimately ended up not being recognized by Blizzard. To make matters more confusing, there were also two weekly tournaments on Strivewire that did, in fact, award points, alongside three that claimed to, but did not. This caused, for example, the well-known pro player Orange to miss out the preliminaries, as he thought he had enough points, but in the end did not. Blizzard’s defense is that all tournaments that are eligible for points are listed on their website. However, this line of argumentation does not carry far, as the incident is about to repeat again. Right this moment, ESL is claiming that its tournaments will award HCT points starting from today, but these tournaments are not yet listed on Blizzard’s site. I am not claiming that the ESL tournaments will not award points, but there is no way to know for sure at the moment. Lesson: Blizzard needs to take a more active stance in approving, monitoring, and promoting the tournaments that are eligible for HCT points. 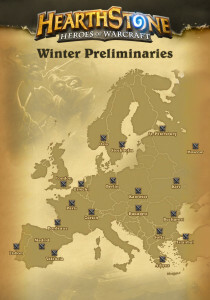 The preliminaries are played online, but only from selected offline locations throughout Europe. Everyone who wants to participate, has to travel to these locations in order to play, mostly on their own expense (the top-8 points earners had their travel expenses covered). While from the map it looks like there are quite a few location throughout Europe, the reality is different. For example, there are no locations in Finland, Denmark, Italy, and Ireland, causing a fair amount of travel for many players – even across the sea. Furthermore, not all locations are equal when it comes to the arrangements. While there has been praise for the arrangements in Stockholm and Utrecht, for example, other locations, such as Berlin and London, have received less praise. Whereas in one place you can have a computer in your use the whole time, in other places you may not have access to such a basic good for a computer game. Lesson: Blizzard needs to seek out more locations if they insist on the use of offline locations, as well as work to ensure uniform environment throughout the locations. Lesson #3: What were the rules, again? The first day of the preliminaries brought about a number of surprises. Now, as I did not receive the communications from Blizzard related to the tournament as I did not have enough points myself, it is hard to say how well these were communicated to the players, but there were many players who at least were surprised by some of the rules. The major bummer here was that multiple players were disqualified and unable to play, because the name they had registered their Battle.net account with was not the same as the name in their ID. So, players traveled to a foreign country on their own expense only to be told that they cannot play. That’s some bad PR, no matter how well Blizzard had attempted to communicate the details in advance. Another major surprise was that both deck trackers and the use of pen and paper were forbidden in the preliminaries. Deck trackers are not widely used in offline tournaments anyway, but many players are used to using pen and paper as memory aids in offline tournaments. This sudden change of environment came as a surprise to many, and when arranging major events, surprises in rules are bad, mmkay. Lesson: Blizzard needs to do a better job of communicating the rules and requirements to the participants. Lesson #4: You want me there how fast? And on Valentine’s Day? The timing of the tournament as well as the timing of the final invitations was relatively unfortunate. February 14th happens to be Valentine’s Day, and the tournament took place on 13th and 14th. Furthermore, the final invitations were sent on February 7th, which left people less than a week to make their travel arrangements. As this included traveling to a foreign country for many players, the cost of such travel on short notice is significantly higher than it would be had everything been clear earlier. Lesson: Blizzard needs to check their calendars more carefully and allow for adequate time for the players to arrange travel. Lesson #5: Why did we have a double elimination bracket again? However, the double elimination system used at Battlefy, the platform chosen for the tournament, does not flip the lower bracket. When you flip the lower bracket, players who have already faced each other meet again in the lower bracket as late as possible. When you do not flip the lower bracket, players who have already faced each other meet again in the lower bracket as soon as possible. When the purpose of the preliminaries is to find out the top 16 players for the money and the top 8 players for the Championships, and not just the top 2 players of this particular tournament, not flipping the lower bracket is detrimental to achieving this goal. Lesson: Flip the lower bracket to get a more accurate top 8 and top 16. Even better, use a Swiss system for even more accurate results. Let’s try to end this on a positive note. Blizzard sought new casting talent to complement their existing lineup with an open tryout – casting a video of two Blizzard employees playing Hearthstone and uploading the cast to Youtube for Blizzard to review. This resulted in several new casters for the preliminaries, and based on the EU preliminaries, was a success. Lesson: You can achieve great things when you are open and engage the community. You can do even more of this! All Blizzard graphics ©2016 Blizzard Entertainment, Inc. All rights reserved. All such content is used on this website in accordance with Blizzard’s public policy on material use on third-party websites. Hey! I love seeing constructive criticism after events =) I’m Rushan from Battlefy and just wanted to touch on #5. We ran into a bug with the bracket yesterday where it wasn’t flipping the lower bracket correctly for Round 5 onwards. We were able to manually set things right so that by the time those rounds were played, players were in the spaces they should have been. I apologize for the confusion. The tournament was able to run without being affected by early rematches. On a more personal note, I enjoy Swiss too a lot as a player but it’s important to keep in mind some of the streaming issues that come with it. There’s a lot of deadtime associated with Swiss which can make it hard to retain an audience. Positives and negatives to both formats. Regarding the Swiss format, I’m not convinced that there are significant streaming issues having followed a number of Swiss format Magic: The Gathering tournament streams, which seem to be doing fine, and Dreamhack Winter in Hearthstone wasn’t that bad either. It does take some planning to fill the gaps, but Magic is doing this very well with deck techs and the like. The potential issue I see with Swiss is the large number of matches that need to be played in order for meaningful records to make it through – if you play a Swiss where you need an x-0 record to make the cut, that’s a pretty harsh Swiss (Is it really a Swiss?). Considering the arrangements of the Winter Preliminaries for example, some locations had computers for the players to use all the time, whereas others were lacking space and equipment – not something you can afford if you want a smoothly progressing Swiss tournament. The locations really annoyed me, I found them straight up ignorant to life in Europe. It isn’t Blizzards fault of course, but you’d have thought they’d just hire some people that know what they’re doing. The location of London, and the venue chosen in London I found particularly annoying. London’s the hardest place to get to in the UK obviously, if you just spent a few seconds thinking about it and perhaps looking at a map. Previous Previous post: Is Standard the end of sticky minions in Hearthstone?